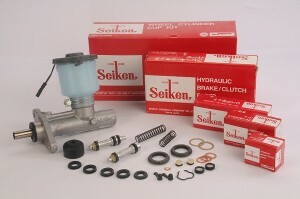 Seiken brake & clutch parts have been perfected after many years of research & development. Founded in 1959, Seiken Chemical Industry Co Ltd occupies not only a major share of Japanese.market, but are acclaimed throughout the world for their high quality, reliability & availability. For customers who care about their safety & life only Seiken assures them the quality they desire. It is therefore no surprise that despite competition from cheap products, customers always demand Seiken Brake & Clutch Parts.